Elena was born by parthenogenesis (a literal virgin birth). Aside from some voices she's heard her whole life, that is pretty much the only remarkable thing about her. That is until the day that a boy shoots a girl in front of her and Elena finds that she is able to heal the girl by laying on hands. Stranger, immediately her miracle healing performance, the boy is swept up in a beam of light and disappears forever. 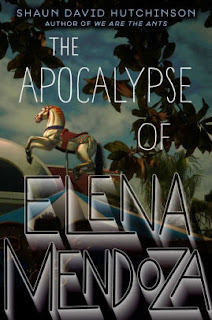 Elena has found she has the ability to heal, but it comes with a trade-off. Each time she uses the power, people disappear from the Earth. If it's any comfort, the voices assure her that this is what she is supposed to do. In fact, it is the only way to save the human race as end times approach. She isn't so sure and doubts that the voices are really telling the whole story. Letting people suffer seems cruel, but causing unsuspecting people to be swept away to an unknown fate is no better. The dilemma dominates the story as Elena and her friends grapple with the events occurring around them. A bizarre but certainly original premise with a lot of clever banter. It's a fast read and overall entertaining as long as you don't try to make much sense of the story. A lot of time is expended in discussing the ethics and ramifications of the situation. At times these can be profound but they go on entirely too long and there's a degree of repetition. The premise may be bizarre, but the characters are quite normal, which makes the most interesting part simply watching a smart and witty heroine deal with patently surreal circumstances. And, unlike so many male YA authors, Hutchinson doesn't make the whole story about hormones and profanity.